Truffles are recognized as one the most prized culinary delicacies all over the world. From a purely scientific standpoint, a Truffle is a fungi (mushroom): a plant lacking of chlorophyll, therefore relying on symbiosis for survival. 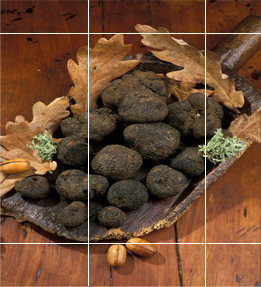 Black Périgord Truffle (Tuber Melanosporum), harvested in South-eastern France, in the Périgord region, between late November and early March. White Piedmont Truffle (Tuber Magnatum) from the North-western region of Piedmont in Italy, found between August and January. Burgundy Truffle (Tuber Uncinatum), harvested between September and late December in Burgogne, France (Burgundy) and some regions of northern Italy, specially near Parma. Winter Truffle (Tuber Brumale) also called Musky Truffle. Its habitat and seasons are very similar to those of the Black Truffle. Summer Truffle (Tuber Aestivum), it has one of the most extensive habitats: from southern France, Spain and northern Italy to some regions of Germany and southern England. Harvested from May to June. There are also other less known varieties, such as the Bianchetto (Tuber Albidum), North American Pale-Colored truffles and several species of Asian truffles. But there is so much more about this intriguing food. Few edible plants (if any) are surrounded by such passion, veneration, history, tradition and controversy. Its demand and value on the marketplace are unbelievably high. Many describe the taste and particularly the aroma of Truffles as an extremely powerful experience. Where does this reputation come from? A number of factors come into play, but they can be bluntly divided into 2 categories; the first one has to do with production and sales processes, the second one involves a subtle, but equally important cultural phenomenon. Regarding the first category, truffles have a short season and are almost impossible to cultivate, they present unreliable crops and are highly affected by summer rain. There are also the problems of shelf life, uncertainty of supply, as well as a limited amount that can be gathered by the trufflers on a given period of time. Finally, the are a series of somewhat unpredictable trade rules and taxes that affect the price, in particular for export markets. In the second category there is the taste and aroma. The taste can be described as intense and earthy; depending on the variety, it can be reminiscent of other flavors like garlic, shallots, hazelnuts and even chocolate. As for the aroma, elevated by some specialists to the rank of “perfume” it is one of the most sought-after qualities of the Truffle. Odd, unique, penetrating, intoxicating, pungent, these are but a few of the words commonly used to refer to it. A less openly admitted, almost taboo subject about it, is its aphrodisiac, sensual effect. Indeed, it has been proven that truffles produce pheromones to spread their spores. As Jean Marie Rocchia puts it on his book Truffles, the Black Diamond and other kinds : « the truffle is a vegetable whose perfume has something animal about it ». Both aspects have created a mix of supply-and-demand facts, myth and cult about the truffle that remains unparalleled in the culinary world. Truffes.com is proud to introduce you to the fascinating world of the truffle: from its origins and gastronomic culture, to recipes, wine pairing and more. Whether you are new to their wonderful taste and aroma, or a connoisseur looking for fresh, top-of-the-line Black truffles, you will be sure to find everything you need right here. We carry the best selection of fresh Black Truffle products available online, delivered fast, right to your door. We also offer you a complete set of information and resources on this gastronomic treasure.